Bad breath or halitosis can be extremely embarrassing for anybody that suffers from it and extremely unpleasant for your friends or family. According to estimates as many as 25% of the worldwide population suffers from frequent bad breath. The major cause is poor oral hygiene but there are others that we will look at. 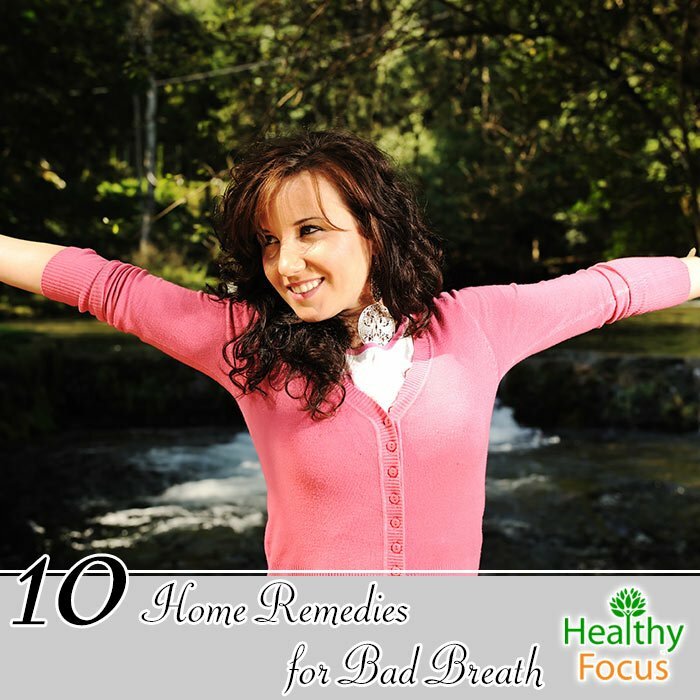 There are also plenty of very effective natural remedies that can help freshen your breath and eliminate halitosis when used regularly. Halitosis is sometimes associated with disease but more often than not, the cause is simply poor oral hygiene. Halitosis is actually the third biggest reason that people visit their dentist following gum disease and tooth decay. Why does my Breath Smell so Bad? When bacteria breaks down the small food particles, sulfur compounds get produced and these compounds are the cause of the foul odor. Simply improving your oral hygiene or quitting smoking might help resolve the issue but if it does not, then it is best to consult a doctor to rule out any underlying conditions that may be causing your bad breath. Bad breath odors vary and the specific odor depends on the actual cause. It is quite difficult to gauge the odor yourself and it may be a close relative or friend that lets you know. Licking your wrist and allowing it to dry before smelling it can let you assess the extent of the problem. If the wrist smells foul, there is a very good chance that your breath smells equally as bad. The following are the biggest reasons for your breath smelling bad. Certain Types of Food : Certain types of food such as garlic and onions are notorious for causing bad breath. Once digested, their compounds are broken down and carried to the lungs through the blood where they have an impact on your breath. Poor Dental Hygiene : Making sure that you brush your teeth well and floss them often ensures that the food particles which lead to odor are properly removed from your mouth. If you do not brush often enough and well enough, bacteria will build up in the form of plaque. Plaque both irritates your gums and also causes a bacterial build up between the gums and the teeth. If you use dentures, make sure that you clean them properly and remove them at night. Smoking : It is no surprise that smoking and tobacco products can result in a particular type of unpleasant odor. Smoking also increases the risk of gum diseases which also cause bad breath. Medication : Certain drugs can also reduce saliva production resulting in halitosis. Other medications such as nitrates for angina and some sedatives can also produce bad odors as they are broken down by the body. Dry Mouth : If your mouth does not create sufficient saliva owing to disease like xerostomia or if it is dry just after waking up, odors tend to build. Certain Diets : Low carbohydrate diets like the Atkins diet cause the body to go into ketosis. The ketones produced can cause bad breath. Disease : Certain types of cancer, liver disease and metabolic disease can result in halitosis because of the specific chemicals they produce. GERD is also known to cause bad breath because of stomach acid reflux. How to you Cure Halitosis? Improving your oral hygiene routine may well be sufficient to cure your symptoms. If you smoke, then quitting can have a major impact. There are however a number of alternative, natural remedies that should help. Fennel is one of the very best natural treatments for your bad breath. It can help freshen help to up your breath because of its natural fragrance and it antimicrobial properties which help destroy the bacterial build up in your mouth. You can simply chew on a spoonful of fennel to help stimulate saliva production, kill bacteria and freshen up your breath. Alternatively, you can make a nice cup of fennel tea with the seeds and drink it up every morning and evening. Cloves are a very well known treatment for various oral issues including toothache and bad breath. Cloves have excellent antibacterial properties while their strong fragrance help keep your breath fresh throughout the day. The most convenient way to make use of cloves is to just pop a couple of pieces in your mouth and chew them. An alternative is to make clove tea with a teaspoon of cloves. Drink the tea or use it as a natural mouthwash morning and night. A tea made with fenugreek is an extremely effective home remedy for halitosis especially when your breath problems are caused by an infection. To make the fenugreek tea add a teaspoon of seeds to a mug of water. Boil, then steep and strain before drinking twice a day. Cinnamon is another herb with excellent antibacterial qualities owing to the presence of cinnamic aldehyde. As well as killing of bacteria, cinnamon smells great and can help sweeten up your breath. Boil a teaspoon of your cinnamon powder or fresh cinnamon in a mug of water. Allow the mixture to steep for 10 minutes than strain it away. Use the solution as a natural mouthwash morning and night. Lemon juice is a time honored treatment for halitosis. Its acidic levels help prevent bacterial growth in the mouth while its citrus scent helps mask the smell of your breath. Stir a tablespoon of fresh juice into a glass of water and use it to rinse out your mouth every morning and again before bed. Chewing on some fresh parsley can help to freshen up your breath because of the presence of chlorophyll in the herb. We have already done an article on the benefits of brushing your teeth with baking soda. It is cheap and convenient and can help brighten up your teeth. Another advantage of baking soda is that it helps to balance out the acid levels in your mouth and fights off the bacteria that causes halitosis. You can simply brush your teeth by dipping your brush in baking soda or add a teaspoon to a cup of water and use it as a mouthwash twice a day. Apple cider vinegar also helps to balance your mouth’s acid levels and is used for a wide variety of reasons. To help treat bad breath, just add a tablespoon to a cup of water, stir well and drink it up before your meal. You can also use your apple cider vinegar to make a natural mouthwash or gargle. There are plenty of essential oils with antiseptic and antibacterial properties that can be used to keep your breath smelling clean. It is not recommended to take most essential oils internally but they make for a great natural gargle or mouthwash. Some of the best options for oral health are tea tree, peppermint, clove, cinnamon and lemon essential oils. Just ad a few drops of your chosen oil to a glass of warm water and use it to gargle with every morning and again before bed. Ordinary tea can actually help freshen up your breath but herbal teas may be even more effective. Some of the best choices are antioxidant rich green teas, sage tea and clove tea. Have you ever used any of the remedies we have highlighted above or do you feel there are other better options to treat halitosis. Please let us know and we will ad your treatment to the list.